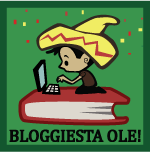 The Bloggiesta is on! This event runs January 8 through 10 and is hosted by Maw Books Blog. You can check out the initial post on your own, but the main goal is to work on one's blog (plan, edit, develop, review, organize). I am hoping to get a lot accomplished, the first of which will be changing my template. I keep putting it off, but with an official event, I am raring to go. In fact, I've done the first mini-challenge hosted by Kristen at Bookworming in the 21st Century. I joined the Bloggie Cult and posted two html help websites. Sounds like fun, we'll check it out! This is one of those events that I would love to participate in, but which falls at a bad time for me. Maybe next year! Keep up the good work and thanks for the tip.